It is the slightly irregular deeply lobed leaves that give this plant its common name. It is also a plant with large internodes, so it is sparse in growth habit. 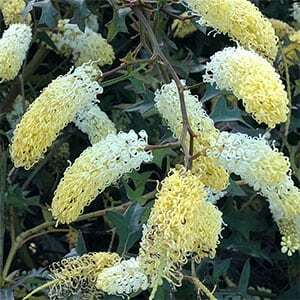 The flowers are slightly fragrant and will attract bees and birds to the garden. Pruning will create a slightly more bushy habit, however the natural open habit dominates. 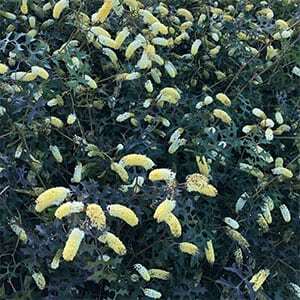 This is a plant that looks at its best when planted between slightly denser growing shrubs. Look for grafted forms for best results outside its natural climate zone. In areas of heavy clay soils, or poor drainage, consider hilling up the soil before planting. Planting on a raised area will help prevent root problems. No fertiliser is requires in good soils. You can use a little specialist native plant fertiliser (low phosphate) in poor soils if desired. Best lightly tip pruned after flowering to encourage more flowers. Common Name – Zigzag Grevillea, Tangled Grevillea. Spread – To around 1.5 metres. Foliage – Mid glossy green, deeply lobed.